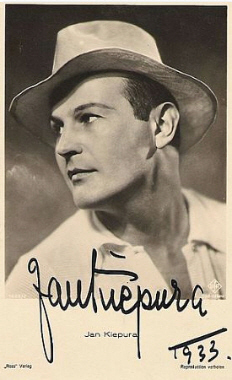 The singer and actor Jan Kiepura took singing lessons by Waclaw Brzezinski in Warsaw in 1922 against the will of his parents. After a failed start as a chorus singer at the Warsaw opera he intensified his singing training. When he got his first engagement at the opera in Lemberg in 1925, this was the beginning of a splendid career which only few opera singer were able to experience. In the following years he appeared in half Europe and had great successes. Important milestones were his engagements at the Scala in Milan in 1928/1929 and in Paris. Eventually he left Europe and toured in South America, from 1931 also in the USA for the first time. Jan Kiepura made his film debut already in 1926 with the Polish production "O czem sie nie mysli", but his real career came with the talkies of course. At this moment he was already a world-famous opera singer to whom the audience "lay to his feet". Jan Kiepura lured the viewers into the cinemas with the movies "Die singende Stadt" (30), "Das Lied einer Nacht" (32) and "Ein Lied für Dich" (33). When he played at Martha Eggerth's side in the movie "Mein Herz ruft nach Dir" (34) he found his true love with her which lasted till his old age. They acted also together in the movies "Zauber der Bohème" (37) - their greatest success - "Addio Mimi!" (47), "Walzer der Liebe" (49) and "Das Land des Lächelns" (52). Besides the film they also formed a dazzling dream couple in public life. When World War II broke out, Jan Kiepura was located in Paris. When France capitulated he went to New York together with Martha Eggerth. There he could successfully continue his career but didn't forget his Polish countrymen. He suppported organisations like "Relief fond for Poland" with generous financial means over and over again. The married couple Kiepura and Eggerth caused a sensation on Broadway and had great successes with the plays "Die lustige Witwe" and "Polonaise". After the war they returned to Paris and Jan Kiepura took part in his last movies, among others "Ihre wunderbare Lüge" (50). They came back to the USA in 1953 where they took up residence for good. A brief time later he got the American nationality. Jan Kiepura has also provoked the environment all his life. On one hand he was the celebrated star on the other hand he provoked with his airs and graces. But from that seat he worked hard for it was certainly difficult not to flip from time zu time. But he always had a heart for the public to which he owned his career in the end.